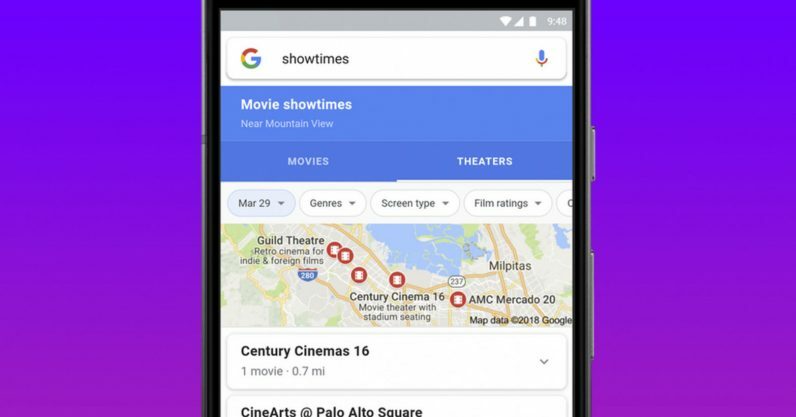 Google is adding a small but useful update to its mobile search app that should make it easier to plan a night out to the movies. A new comparison tool lets you quickly see IMDB, Metacritic, and Rotten Tomatoes scores, as well as a description and showtimes. The movies are listed in a horizontal card interface so you can quickly explore your options. Alternatively, you can see what’s playing by location on a map, and you can narrow you search based on genre, reviews, and even what type of screen the film is being shown on. It’s one less reason to visit a traditional movie site like Fandango to find information about a movie. To be clear, Google will still link to those services once you actually go to purchase a ticket, but the update should make picking something to watch a little more seamless, as you probably would’ve Googled a movie before arriving at its Fandango page anyway.